Arriving in AD basecamp (ADBC) was definatley a very awesome moment. 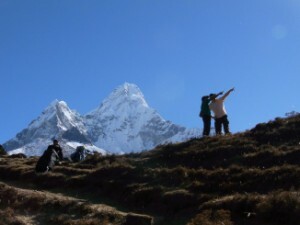 The walk up from Pangboche takes upto 4 hours and gains about 750m. As you walk up the imposing bulk of Ama Dablam looms above you until you finally arrive in the amphitheatre like bowl that is ADBC. One of the more spectacular aspects of arriving at basecampthis year was the sheer mass of snow on the ground. This gave me a bit of a nervous feeling (correctly as it turned out) about the conditions higher on the hill – however I was at this point simply happy enough to have arrived at basecamp and made myself at home in my tent and then went off to the dinning tent for a cup of hot, milky tea ….